For decades, strange blocks inscribed with the word “Tjipetir” have been washing up on the shores of northern Europe without explanation. Now an Englishwoman says the maritime mystery may have been solved. Tracey Williams, of Cornwall, in the United Kingdom, first stumbled upon one of the large blocks while walking her dog and looking for driftwood on a beach near her home in the summer of 2012. “I couldn’t quite make out what it was made of. I was intrigued by the name carved into it. I took it home and I Googled the word, but at the time, there was very little information on it,” Williams said in an interview with Yahoo News. At the time, all she could find online was that Tjipetir was the name of a place in Indonesia. “I put it in my backyard and forgot about it until a few weeks later, when I found an identical one on another beach,” she said. Williams heard that these rubber-like blocks had been washing up in France, Holland and Germany — so she launched a Facebook pageto bring together disparate people trying to figure out their origin. Tracey Williams, of Cornwall, U.K., found two of the blocks washed up on the shores of England. The story attracted the attention of oceanographers, divers, historians, journalists and filmmakers. Many people speculated that the blocks might have come from the doomed Titanic, which sank in 1912, because gutta-percha tablets had beenlisted on the ocean liner’s manifest. And the rubbery tablets are most likely to be made of this material, which is formed from the sap of gutta-percha trees found in the region. But in the summer of 2013, a year after Williams found her first block, she learned about a different possibility. Two people reached out to her, independent of one another, saying the blocks came from a wreck 150 miles west of the Isles of Scilly, off England’s Cornish peninsula. Louise Mamet found a block in France. The wrecksite.eu database says a German submarine torpedoed that vessel in May 1917. The sources knew that the Miyazaki Maru had been carrying the blocks from a rubber plantation in West Java, Indonesia, called Tjipetir. Williams’s sources wish to remain anonymous, but they are not alone in their conviction. Alison Kentuck, the Receiver of Wreck, who oversees the U.K.’s wreck and salvage laws, agrees that the blocks came from the Miyazaki Maru, BBC News reported. Friederike Wegert and her children found a block on the German island of Borkum. Still, Williams is not so sure this is the end of the puzzle. The blocks washing up now are likely to be from the ill-fated Miyazaki Maru, but batches discovered decades ago could still be from other ships, she said. Now Williams wants to learn more about the Miyazaki Maru. One in eight middle-age women in the United States has depression, a new report finds. This means that women ages 40 to 59 have the highest rate of depression (12.3 percent) of any group based on age and gender in the U.S., according to the report from the Centers for Disease Control and Prevention. In all other age groups as well,women had higher rates of depression than men did. Among Americans ages 12 and older, 9.5 percent of females and 5.6 percent of males had moderate or severe depression during the previous two-week period, according to the report, which is based on data gathered from 2009 through 2012. Although there are various approaches for treating depression, studies have shown that a combination of medication and psychological therapy may work best to treat severe depression. However, many people with depression do not get any treatment, studies have shown. Only 35 percent of people who had severe depression reported having seen a mental health professional in the past year, the researchers said in the new report. In the study, the researchers evaluated whether the participants had depression by conducting in-person interviews and questioning about symptoms of depression. Depression can affect both the personal and professional areas of a person’s life. In the study, nearly 90 percent of people with severe depressive symptoms reported having difficulty at home, with work or in their social activities. Almost half of the people who had mild depression reported having such difficulties. The report also found that 15 percent of people who live in poverty had depression, meaning that they were more than twice as likely to have depression as people living above the federal poverty level, who have a depression rate of 6.2 percent. The rate of depression generally increased with age, with 5.7 percent of youth ages 12 to 17 reporting having the condition, but 9.8 percent of adults ages 40 to 59 saying the same. However, people ages 60 and over had a lower rate of depression (5.4 percent) than people in other age groups. Humans can’t see infrared. That’s why we fear animals like snakes, bed bugs, and the Predator. No longer must we live with this fear! Scientists have shown that, under certain circumstances, our retinas actually can detect infrared light. 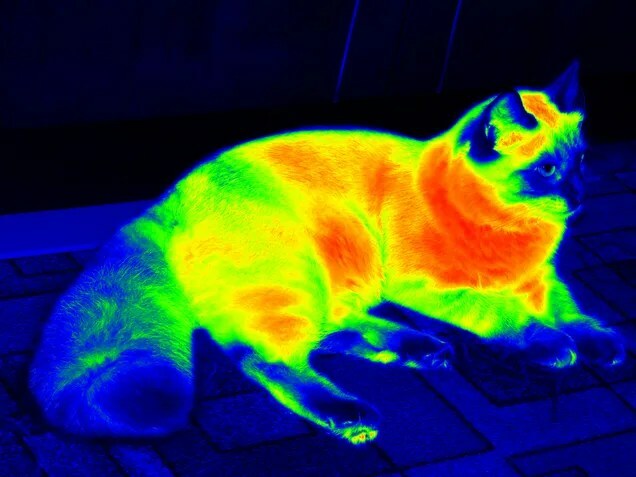 It’s worth noting that, though there are numerous animals that sense infrared light, relatively few of them sense it with their eyes. Snakes evolved infrared “vision” twice. 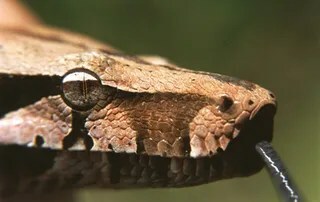 The older boids, a class that includes boas and pythons, have pits lined with heat sensors along their upper and lower jaws. The crotalines, pit vipers, have a sensor-lined membrane stretched above a pit between their eyes and nose. It looks as though the information from these pits combines with vision from the retinas in the vision center of the brain, so they probably do see it. Vampire bats also sense the infrared radiation given off by their prey with pits around their nose. Bed bugs carry their infrared sensor on their antenna. And a certain type of beetle, attracted to fires because it lays its eggs in burnt wood, has pits similar to the boa constrictor. Although all these animals do have eyes, and some have what we would consider “heat vision,” none of them use their optic retina to obtain this heat vision. Scientists at the Washington University School of Medicine in St. Louis were happy to be working with a powerful new infrared laser. One of the important things they needed to do while working with it was checking to see if the laser was off or on. Eyeballing the machine wasn’t going to cut it, as the infrared isn’t visible to human eyes. Which made it odd that people around the lab were seeing flashes of green light when the laser was on. The flashes disappeared whenever the laser turned off again. How could people, without even trying, see infrared light with their retinas when not even animals see infrared light with their retinas? And why was the light green? An international team of scientists decided to experiment with humans and lasers. They used different infrared lasers to flash light at people. The flashes were carefully calculated so that each would give people the same amount of photons streaming towards their eyes, but those photons would come in different intervals of time. A short amount of time meant the infrared photons came in a flood. A long amount of time allowed photons to trickle through the subjects’ retinas. Inside the human eyes are photopigments – pigments that change structure when they get hit by a photon. The part of the photopigment that changes its structure is the chromophore. It is shackled to what’s called an opsin. Give a chromophore just the right amount of energy, and it changes its structure, cutting the opsin loose and starting the process that ends with what we call “seeing.” The only photons with the right amount of energy to change a human chromophore are in the 390-720 nanometer wavelength range. Infrared, in the 1000 nanometer wavelength range, is too big and too low-energy to knock a chromophore into changing its shape. But if huge amounts of infrared photons flooded the eye over a short period of time, two infrared photons could hit the chromophore at once. Their combined energy is enough to cause it to change its structure and allow people to see what they otherwise wouldn’t. Two 1000 nanometer photons add up, energetically speaking, to one photon of around 500 nanometers – which is in the green range of the visual spectrum. 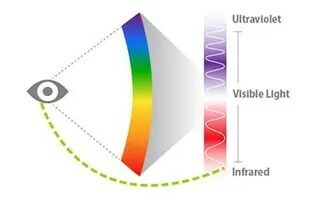 So infrared light, if concentrated enough, would leave us seeing green. Follow Tia Ghose on Twitter and Google+. Follow LiveScience@livescience,Facebook & Google+.